As someone who has not yet had a chance to read The Maze Runner, Inside the Maze Runner, The Guide To The Glade was a treat. Filled with pictures from the film, quotes letting me know who key characters are and interesting tidbits about them, the book tempted me with just enough information to make me feel like I would not be walking into a party full of strangers, but into a room full of acquaintances with whom I have a nodding acquaintance. Without spoiling the plot of the film, the guide shares the key points I feel I need to understand so I can now go into the movie feeling like I have a clue and will understand things, and have no fear I’m going to come out immediately wishing I could see it a second time to figure out the things I did not understand the first time around. For those who read the book some time ago, I would imagine this guide would serve nicely as a memory jog of which characters serve what function within the community/family in the Glade, and helps to associate faces with names. The Guide did a fantastic job of sparking my interest and curiosity about the movie, making me want to see how they would take this premise and bring it to life, especially after I saw the picture of the map room! 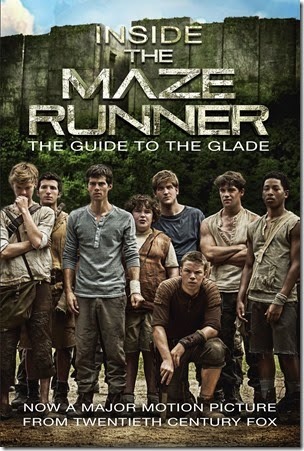 This entry was posted in Movie, Novel, Review and tagged Alby, Aml Ameen, Ben, Dashner, DashnerArmy.com, Dylan O'Brien, Glade, Kaya Scodelario, Keeper of the Fields, Keeper of the Glade, Map Room, Maze Runner, Maze Runner Movie, Mewt, Minho, Random House, Random House Teens, Thomas, Thomas Brodie-Sangster., Twentieth Century Fox, Will Poulter on September 20, 2014 by A Novel Approach.